The good news is that Canadians are living longer. The bad news is paying for it. In 1921 the average life expectancy of a newborn was 57 years. Today, it is 81 years, according to 2007 mortality data. 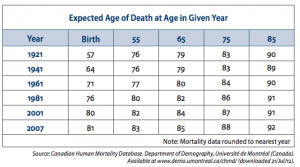 Of particular note is how life expectancy is increasing for older Canadians. Today, a 55-year-old can expect, on average, to live to age 83. An average 65-year-old can expect to live to 85. Note that “on average” means half of today’s 55 year olds will die prior to 83 years and half after. Unfortunately, we can’t predict what side of average we will fall on! In planning for the future, the risk is that we outlive our assets and our money runs out before we do. For example, in 1981, the average 65 year old was expected to live to age 82. Today, the average 65-year-old should live to 85. Everything else equal, today’s 65 year old needs more money on average in the kitty than the 65 year old of 1981, to fund three years of extra living. How much more? That depends on the return assumption expected from investments. Assuming a return of 5%, funding an extra $50,000 spending per annum for three years into the future requires $43,192. At a return of 7%, $40,815 is required. The higher the return, the easier it is to meet future requirements. At a 1.5% return however, which is today’s bond yield, $47,815 is needed. In recent years, the term pension crisis has increasingly made headline news. Pension monies are running out faster than originally thought as returns have been lower than expected and the retired work force is living longer than expected. Most recently, California has seen three municipal bankruptcies, two of which are in large part a result of the realization that past pension promises were simply too rich in light of current economic and demographic conditions. In the current low-return world, meeting our future needs means saving more today or living on less tomorrow. While equity markets have historically earned more than 7% per year, recent market returns have been much less, adding to the anxiety of a baby-boom generation contemplating retirement. Our view is that, longer-term, equity returns should return to historical norms. In the meantime, however, our portfolios have done better than equity markets in general because of our dividend focus. At Leon Frazer, we continue to be “paid to wait” with our dividend-growing companies, with approximately half of the 6%-8% long-term expected equity return coming from the dividends we receive every quarter.